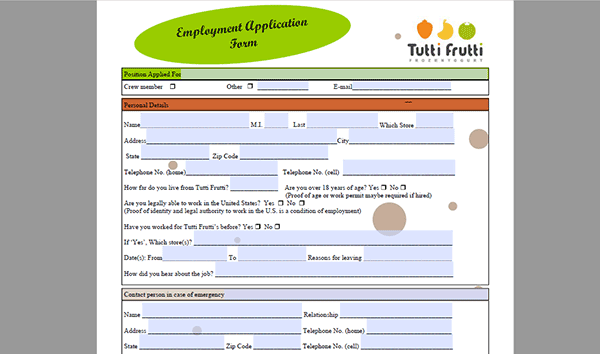 Download the Tutti Frutti job application via the link on this page. The document is available in .PDF format. At this time there currently no online application available. If you’re interested in working at a Tutti Frutti location you must download the document, complete it, and then submit it in-person at your preferred location. Use the guide posted below to learn how to properly fill out the application. About the Company: Tutti Frutti Frozen Yogurt is an international chain of frozen yogurt shops. The brand is based out of Fullerton, California. The company is one of the world’s largest frozen yogurt chains, with locations throughout the United States (as well as the United Kingdom, Mexico, Indonesia, Malaysia, Vietnam, and numerous other countries). Step 1 – Click the link/button near the top of this page to download the form as a .PDF file. How far do you live from the location? Could you work extra hours? If employed will you continue to work this job? Step 4 – Sign your name and then enter the current date (dd/mm/yyyy format).